This tranquil reserve is approx 3 acres (1.2 hectares) in size and consists of unimproved grassland surrounded by a variety of large trees and hedgerow. The site was acquired by the efforts of a few individuals from the adjacent village of Long Marston, a grant from Dacorum Borough Council and Butterfly Conservation. It was finally secured by Butterfly Conservation and dedicated to Gordon Beningfield in 1998 who sadly passed away just before the opening. Habitat management is vital to create and maintain a varied ecology in order to enhance the Lepidoptera (butterfly and moth) species on the reserve and promote other wildlife. We have a busy and varied work plan for 2018 and to achieve our goals we need additional volunteers to join our monthly work parties. Work parties are now held every month on the first Sunday of the month both winter and summer. The Work Parties start at 10 am and finish around 2.30 pm (with a break for lunch) - Parking by the reserve is limited and so it is suggested that volunteers park at Wilstone Village Hall and walk across the fields (see directions below). During the autumn of 2017 the pasture was cut and some areas re-cut in 2018. Hogweed was removed to reduce its abundance. The more aggressive species still predominate generally in the pasture areas and these management activities along with grazing will need to continue for the next few years before significant results will be seen. Some good results have been observed already in some areas of the pasture where clearing of dense areas of scrub was completed. We now have Red Campion, which is attracting butterflies and pollinators. We saw many Cowslip earlier in the year and have some Bird's Foot Trefoil appearing recently. Sections of the stream bed were cleaned up by the removal of fallen branches and general debris. The stream has been flowing continuously since January 2018, although not due directly to the on-reserve cleaning activities. However this is really good news for the biodiversity of the reserve: Many tadpoles have been observed in the stream, along with Banded Demoiselle and Broad-bodied chaser dragonflies, which are attracted to water. Other activities related to maintaining the flow of the stream are under discussion and any progress will be included in future web updates. During the winter a number of both small and large trees came down damaging further some sections of the perimeter fence. Livestock grazing has been secured for the autumn/winter of 2018 and so it is essential that the fence repairs are completed this summer. During the winter we conducted some maintenance in the small woodland at the Northern end of the reserve. The aim was to create a ride to encourage the Speckled Wood butterfly and hopefully to provide increased light to the ground which will hopefully promote the presence of woodland plant species. The butterfly transects were re-started in April 2018, although sightings were low to start due to the cold weather earlier in the year. The strange name possibly originates from a stream-crossing to an old mill long since untraceable. Others contend that it derives from mill-stones laid to enable people to cross the stream. The entire area then was much wetter. Millhoppers is a rare example of a remnant of ancient countryside encircled by arable land. It contains a large section of unimproved grassland. Some of the hedges are thought to date back to Tudor times. It possesses a pond fed by a stream and a public footpath provides access on one side. The site has a large stand of blackthorn scrub which provides good cover for birds and mammals. There are 16 black poplar trees in the hedgerow. This a nationally rare tree, but not uncommon locally. At the beginning, the main efforts were directed to cutting and raking off grass. In addition, the vigorous blackthorn scrub and large banks of nettles had to be contained. In the summer of 2001, a new bridge was built across the stream. It is a good, secure structure, which can safely carry grass cutting machinery. 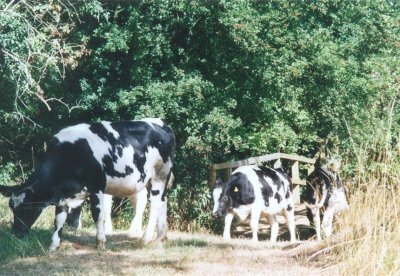 Cattle were introduced to the reserve in 2003, and it was planned that they would graze both in the autumn and the spring. These animals were provided and cared for by a local farmer but unfortunately in 2006 grazing was no longer possible. This meant that more cutting and raking had to be undertaken, whilst new animals were found to graze the reserve. In 2007, an 'Awards for All' grant was obtained, and a new Reserve interpretation board was designed and leaflets printed At the beginning our main efforts were directed to cutting and raking off grass. In addition the vigorous blackthorn scrub and large banks of nettles have to be contained. In 2009, John Noakes stood down as the first Reserve Manager, and Jez Perkins took over. We are most grateful to them both for their dedication and hard work in managing Millhoppers since the Branch acquired it. When walking from Wilstone, follow the public footpath alongside the children's playground next to the Village Hall. Cross the canal via the footbridge and head across the fields towards Long Marston. Go straight on without turning left or right until you reach Watery Lane (aka Astrope Lane). Across the road there is a choice of 3 footpaths - the right-hand one leads immediately to the reserve entrance, which is through a metal gate on the left. Total distance: half a mile. (Grid reference for Village Hall is SP903142 [Landranger Map 165] or postcode HP23 4PE). When cattle and sheep graze the site, dogs must be kept on leads.